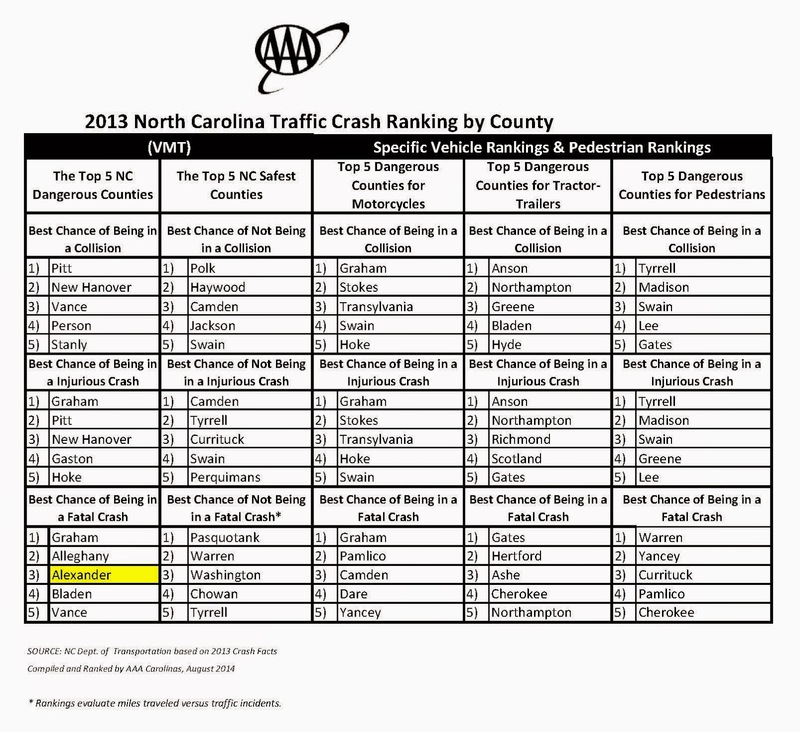 According to an article recently posted by AAA Carolinas, Alexander County was ranked 3rd in a list of counties with the "Best Chance of Being in a Fatal Crash" in North Carolina. "Graham, Alleghany, Alexander, Bladen and Vance counties top AAA’s list of dangerous counties for traffic fatalities last year. The five counties combined for 40 traffic deaths, despite having only two percent of the state’s total vehicle miles traveled." Alexander Rescue Squad would like to encourage you to please use caution and stay alert to the traffic around you as you're driving. It's easy to get distracted by a phone, radio, or even a child, and distracted driving is one of the leading causes of traffic accidents nationwide. We also ask that you keep in mind the soon coming presence of school buses on the roadways, and prepare now to start allowing yourselves extra time to get to and from your destination during school times. Remember to NEVER pass a stopped school bus, and always be ready to stop immediately, around bus stop areas, should a child run out in front of your vehicle. These few simple things could make the difference in a child or other loved one losing their life. Lets change these statistics in the upcoming years, and make Alexander county one of the safest county's to drive through.